I have always enjoyed reading Eric Toensmeier. His enthusiasm for perennials is infectious and we have planted several varietal selections found in his 2007 book “Perennial Vegetables” on our farm in Barre, MA. The amazing 1/10 of a acre he and Jonathan Bates planted to perennials in their back yard in Holyoke, “Paradise Lot”, is a wonder of diversity. Many of us in NOFA have been focused on developing practices and tools that sequester carbon and mitigate climate extremes when raising primarily an-nual crops, especially those grown in the northeast. The term “carbon farming” has been used for these practices (although often, according to Toensmei-er, it is associated with direct compensation of the farmer for such sequestration.) Now Eric has taken on the long-needed task of analyzing perennial plantings from the same perspective. The book is organized into 5 detailed sections plus some useful appendices, sources, etc. The first section, fifty-some pages in all, explores the “Big Idea” behind the book: the good news of carbon sequestration. An introductory chapter ad-dresses climate change, its causes (including agriculture) and impact on people around the world, and the need to sequester greenhouse gases already in the atmosphere as well as drastically reduce emissions. The second chapter relates in some detail how good agriculture can manage this, both by reducing agricultural emissions and by increasing yields via agroecological intensification. But the primary focus here is to explain how carbon is sequestered via photosynthesis with the assistance of an amazing microbial ecosystem belowground. The third chapter follows up on this by looking at various crops and cropping systems to see which have the greatest sequestration potential. He discusses here some of the complexities involved in arriving at useful numbers in such analyses: climate variability, soil versus biomass carbon, depth and tech-niques used in measurement, etc. The fourth chapter in this section goes into detail on agroforestry and perennial crops and systems, distinguishing among various types and subtypes. 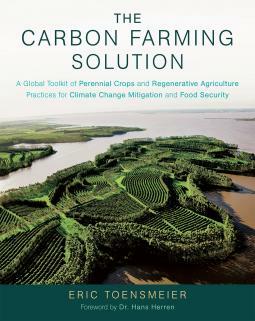 Finally, a chapter on carbon farming and its multifunctional benefits finds its roots in permaculture design principles, con-trasts it with geoengineering, and talks about its benefits to the ecosystem, the farm, and society. The second section, a little over sixty pages, is the Global Toolkit mentioned in the book’s title. Starting with chapter 6 on annual cropping Eric lays out its current dominance in food production (89% of global cropland) and mentions his own preference for a transition to agroforestry-based perennial systems. Toensmeier discusses various ways of using annuals including Conservation Agriculture, Rice Intensification, and Organic, then devotes more than half the chapter to ways of integrating perennials with annuals (strip intercropping, alley cropping, hedgerows, pasture cropping, etc.) Chapter 7, on livestock systems, addresses the various ways that 12 billion acres around the world are used for pasture. This includes discussions of integrating livestock and crops, managing for pasture improvement, silvopasture (integrating pasture and trees), fodder trees and green corrals. Chapter 8 on perennial cropping looks at agroforestry, monocultures like orchards, bamboo, herbaceous biomass crops, aquaforestry, and perennial grains. A following short chapter 9 on additional tools to deal with specific problems delves briefly into topics such as rainwater harvesting, terracing, keyline design, biochar, and indigenous management. The concluding chapter ten in section two is on Species. This is an effort to prepare us for the next two sections, which deal with perennial staple and in-dustrial crops. In this chapter Eric defines the categories he uses to classify cultivation status for perennials – such things as scope of plantings, wildness, whether newly developed, experimental, etc. In addition he lists 10 climate categories – tropical, highland, boreal, arid, etc. – he uses to classify growing conditions. An interesting section here talks about breeding perennials. Toensmeier feels a real sense of urgency in this task as climate change mitigation needs to happen quickly and breeding a perennial variety of what we know as an annual can take 5 to 10 years for a crop like rice and a generation or more for something like maize. He also singles out efforts to breed better varieties of existing perennials such as: Roger Leakey’s farmer-driven plus-trees at the World Agroforestry Centre, perennial grain development in Salinas, Kansas and in China, and hybrid swarm breeding of nuts in Minnesota. Section three deals with Perennial Staple Crops, the tree and other long-lived plants that provide the human diet with proteins, carbohydrates and fats. These once fed much of the world’s population, but were ultimately out produced by annuals, particularly annual grains. Now oil palms, coconuts, bana-nas, olives, dates, avocados, and many nuts are eaten by billions daily, but occupy a far smaller portion of our diet than annuals. The first chapter intro-duces these crops and their groupings. The following chapters focus on crops for starch, carbohydrates, protein, protein-oils, edible oils and sugars, re-spectively. These crops are discussed regarding their uses, yield, harvest and processing, carbon farming aspect, and crop development. ‘Carbon farming aspect’ here is usually what you might get in a normal gardening book as information on how the crop grows, other uses than human food, whether it tol-erates shade or cold or wind or coppicing, fixes nitrogen, needs trellising, likes certain companions, etc. Section four focuses on Perennial Industrial Crops much as section three did with Perennial Staple Crops. Industrial crops are those used for materials (lumber, paper, textiles, plastics, rubber), chemicals (paints, soaps, glues, lubricants, dyes, medicines, solvents, stabilizers, flocculants) and energy (fire-wood, charcoal, illuminating oils, alcohols.) The introductory chapter makes this clear and features the example of the osage orange. A cold-hardy mem-ber of the mulberry family, its fruit is inedible and somewhat toxic. But it has promise as a source of oil, hydrocarbons, and sugar. Dried, the fruit is 16% protein, 15% sugar and 18% oil. The seeds are 34% protein and its oil is being looked at as a biodiesel feedstock. Its wood makes great archery bows and is the best firewood in the country. Toensmeier suggests that developing plants like this can result in a whole bio-based economy replacing today’s fossil fuel-based one. He cautions, however, against industrial scaled monocultures of any crop –those have created many of the social and environmental ills of the past. He also warns against trying to continue our level of energy consumption, instead getting what we need from wind, water, and solar. For materials and chemicals he would rely on perennials grown on diversified farms and processed locally using appropriate technology. Following this stimulating introductory chapter are crops raised for biomass, industrial starch, industrial oil, hydrocarbons, fiber, and other uses. As in section three, Eric analyzes scores of crops in great detail, citing interesting uses, facts, and histories. Starting with chapter ten on Species and running through the seven chapters on staple crops and the seven on industrial ones, this text runs almost 200 pages and could clearly make a wonderful book of its own on the potential for transforming our society through research, breeding, growing and using perennial crops. Toensmeier is at his best here, informative and inspiring both. to support farmers in making the transition,to finance effective carbon farming efforts, and to remove policy barriers. Toensmeier repeatedly asserts that we are living in the last days for effective action against climate change. He rightly feels that many farmers and others have already gotten the message and are developing and practicing carbon farming systems. He finds inspiration in the example of Cuba, learning virtual-ly overnight to transition its industrial agricultural system to one functioning without fossil fuels. Many indigenous communities also exhibit sophisticated agricultural management, balancing human needs with biodiversity and ecosystem function. He calls for stopping the feeding of annual grains to livestock, with ruminants to subsist on pasture, monogastrics on perennial grains, and insects to be developed as both food and feed. To support farmers he feels lo-cal perennial nurseries should be encouraged and simple farmer-based carbon measuring tools developed. To finance carbon farming Eric believes we need to spend far more to cover the costs of transitioning to a low-carbon global economy, especially agricul-ture mitigation work. He finds that carbon offsets are ineffective in reducing greenhouse gases, that few carbon funds go toward agricultural practices, and those that do require huge land areas to be attractive. He would like to see financing go to small-scale and grassroots farmers. Toensmeier also sup-ports carbon certification programs like the one proposed in Vermont as a way for market forces to provide price incentives to responsible farmers. Barriers to carbon farming, he feels, are created by trade policies promoting mono-cropping, mechanization, and agrichemical use. Small farmers, wom-en, and indigenous people are often the ones who are most productive and can implement new practices most easily. Perhaps they should be paid to in-crease carbon soil content in whatever ways work for them? Ninety-two percent of farmers occupy only 25% of farmland. Perhaps land itself needs to be more widely distributed? Eric sees the need to educate governments and policy makers about the basic facts of carbon farming. The individuals, journalists, farmers, students, ac-tivists, NGOs, agencies, businesses, funders and investors of the world all have a role to play, which he lays out for them on the last pages of this book with hope and energy for the transformative challenge it will be. I did have some issues with this book, however. One misprint I noticed makes me wonder if others might also have missed the editor’s eye: a key graphic, Figure 3.1 on page 31, was mislabeled so that the source of the studies (single study versus review or estimate) was reversed. A more significant issue is whether carbon sequestered as aboveground biomass in living plants should be equated with carbon sequestered in soil. Eric discusses this and makes clear that he considers the two equally valid. I think carbon flow is quite nuanced. Biomass crops are limited carbon sinks, planted for the purpose of later harvest and consumption, at which point they release their carbon back into the atmosphere. Soil carbon, on the contrary, is an almost limitless sink and can be rebuilt – as our geological history has shown – by natural processes to astonishing levels. It is important, to my way of thinking, for the reader to be informed whether the values cited as sequestered carbon are soil-based, biomass-based, or both. But the book does not make this clear. You have to go to the studies Eric cites to learn that many of the high carbon numbers he presents for annual sequestration by agrofor-estry, for instance, derive from biomass increase rather than soil building. Another issue is the impact of methane given off by ruminants. Christine Jones and other scientists feel that methanotrophs, microbes that feed exclusively on methane and are present in any healthy soil, will quickly digest and break down this potent greenhouse gas. I saw no accounting of this natural process in Eric’s treatment of the subject in chapter seven. Despite my concerns, however, a work of this size and significance is an impressive major effort and Toensmeier is to be thanked for putting it forth. Por-tions of it, especially those showing the depth of his knowledge of perennials, are quite illuminating. I am sure it will be much read and studied. It is an important addition to the canon of carbon farming and especially perennial literature and I hope the paperback is soon available.